Beth E. Scanlon | Fafinski Mark & Johnson, P.A. Beth joined FMJ’s team in 2011 and is part of the Transportation & Logistics, General Corporate, and Real Estate practice groups where she supports and assists client’s and practice area team members in completion of various kinds of transactions. In her role in the Transportation & Logistics group, Beth focuses on commercial and private aviation, including sale, purchase, lease and financing transactions. 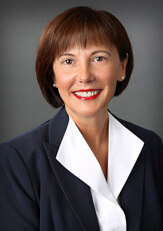 Prior to joining FMJ, Beth worked at Northwest Airlines for 22 years, in which 15 years was spent in the Aircraft Transaction group where she managed and coordinated processes needed to handle financial aircraft transactions, served as a liaison with aircraft owners, lessors and lenders, worked with legal counsel and other individuals to complete aircraft transactions and took part in the administration of the airline’s aircraft debt and lease contracts. Beth and her husband Joe reside in Rosemount, MN where they enjoy spending time with neighborhood friends and watching World War II movies and documentaries on TV, as well as listening to music of that era. They are also fans of the Minnesota Vikings, Twins and Wild. In her spare time or on vacation Beth enjoys reading.